Long-tail keywords are something of a low-hanging fruit in the SEO world but that doesn’t mean they are unimportant. Yet, in a rush to chase the biggest keywords possible, many SEO campaigns fail to secure these other searches. If your end goal is to drive traffic, then all branches of visibility need to be considered – so why not look at long-tail keywords again? Many people in the SEO industry assume that a search with 3 or 4 words is, by definition, a long-tail query. In this instance, this is not what ‘long-tail’ specifically refers to. If you view all of your keywords on a search demand curve, you will see that the initial, popular keywords have high visibility. However, as the search volumes readily diminish you end up with numerous queries that get smaller amounts, ‘tailing’ after the bigger terms. It’s this long-tail – which often out numbers the initial high results – where such keywords come from. It’s entirely possible to have terms that consist of one or two words. Misspellings or uncommon terms can be a perfect example. A recent study of longtail keywords from Ahrefs found that over 40% of all searches (in this case, the study focused on the US but there’s little reason to think this drastically changes elsewhere in the world), with 4 and 3-word searches both retaining over 20% of searches as well. In other words, it can be argued that longer keywords represent the majority of search queries. Of course, you should still focus on the main keywords, but this simple fact shows what opportunities can be missed if you don’t pay attention to the smaller queries. Of course, while long-tail queries are quite common, the sheer variety of terms also means that each particularly keyword often gets searched relatively little. Ahrefs same study found that 93.02% of queries have less than 19 monthly searches, with 96.54% having less than 50. This highlights just where most keywords sit on the curve, discussed earlier. For the purposes of producing content, this means that you need to consider adding more than just one or two keywords. Fighting for specific keywords worth a few searches will not make a big impact on your SEO campaign but, if you manage to improve your visibility for a decent handful, this can make a noticeable change. One-on-one, it’s easy to see why many SEO experts focus on the big keywords. Yet the real power of a long-tail keyword is that, combined, they can easily match the opportunities of the bigger terms. If a query gets 20,000 monthly searches, you can fight your way up the SERPs, but you’re still only getting a percentage of this traffic. You could, for example, only get around 25% of this traffic (a generous estimate) of around 5,000 visitors. However, by also targeting relative keywords (such as more uncommon terms or even questions) your page could come up on 10, 20 or even more long-term keyword pages. If each of these contributes 10 visitors, that could be an extra 100, 200 etc. users for the purposes of traffic. 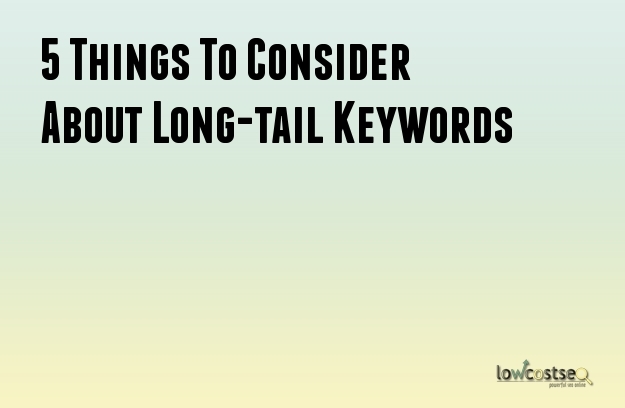 The general argument also states that long-tail is a niche: it’s easier to improve your visibility here because the demand is less competitive, due to more-specific search terms that narrow the niche even further. How Can You Implement Long-tail? Of course, you can’t just go and stuff all of your content with long-tail keywords. Instead, you need to be careful in targeting the right terms. Look for questions that you can naturally fit into your content (and answer, of course) and other terms that can naturally work. For other terms, trust that Google’s algorithm can understand the semantic nature of the search. After all, there are many terms, such as misspellings, that often receive traffic, yet this doesn’t mean popular websites are deliberately misspelling words to trip Google’s internal system.